By worshipping Shiva Parivar, one can have Peace, Prosperity & Unity in the family. Since worshipping Lord Shiva Pariwar gives blessings of all the four deities ( Lord Shiva, Goddess Parvati, Lord Kartikeya & Lord Ganesha ) together. 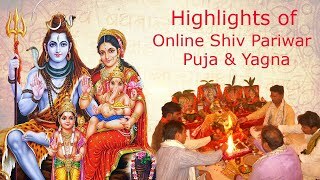 The exact Date and Timings of Shiva Parivar Puja will be informed to you through an email and your representatives are most welcome to attend the same.